All the information on this website is published in good faith and for general information purpose only. www.cscrumbs.com does not make any warranties about the completeness, reliability, and accuracy of this information. Any action you take upon the information you find on this website (www.cscrumbs.com), is strictly at your own risk. www.cscrumbs.com will not be liable for any losses and/or damages in connection with the use of our website. This blog is a personal blog written and edited by me. This blog accepts forms of cash advertising, sponsorship, paid insertions, or other forms of compensation. The compensation received may influence the advertising content, topics or posts made in this blog. That content, advertising space or post may not always be identified as paid or sponsored content. This blog does not contain any content which might present a conflict of interest. By using our website, you hereby consent to our disclaimer/disclosure and agree to its terms. 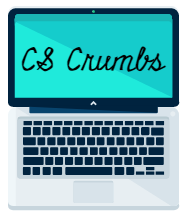 If you require any more information or have any questions about our site’s disclaimer/disclosure, please feel free to contact us by email at cscrumbs@gmail.com.